Frank Gumienny goes way beyond traditional accounting duties to grow fan connections and success on the field. You could say that winning has been their strong suit recently. After claiming their first-ever Super Bowl championship in early 2018, the Eagles saw the team’s value rise more than $100 million to $2.8 billion, according to Forbes. Despite the Eagles raising prices for the 2018 season by $5 to $25 per ticket, more than 40,000 fans sit on the waiting list clamoring to get them. As CFO, Mr. Gumienny plays a multidimensional role to create that passion and experience. 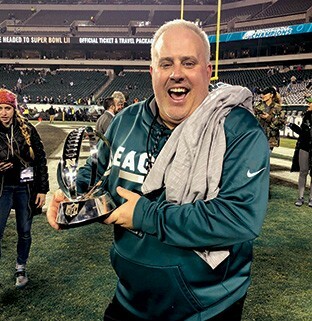 Beyond the traditional finance and accounting domain, he is in charge of ticket sales, IT, guest services, merchandise and booking concert and auxiliary events at Lincoln Financial Field—the Eagles’ multipurpose stadium erected in 2003. One day, he might find himself negotiating a deal for country singer Kenny Chesney to perform at the Linc (as locals call the stadium). The next, he might be across the river in New Jersey, visiting the farm that grows the sod for the football field. It was not this way when Mr. Gumienny joined the Eagles two decades ago. After earning a bachelor’s degree in accounting, he worked for four years at PricewaterhouseCoopers. When a friend told him about an opening at the Eagles, he quickly updated his résumé. He was the first certified public accountant hired by the organization. As a consummate team player, Mr. Gumienny often said “yes” when things needed to be done. That meant handling all sorts of tasks that did not involve ledgers or spreadsheets. He volunteered to drive the team van to the airport to pick up new players unfamiliar with the city. And he spent 10 years as a spotter for the team’s radio broadcast (see “On the Spot” sidebar below). He steadily worked up the ranks, becoming director of finance in 2003 and then CFO in 2012. It was as director of finance that his role began to expand beyond bookkeeping. This was because the Eagles moved into the state-of-the-art Lincoln Financial Field the year he was promoted. The team had previously played in the city-owned Veterans Stadium for the past three decades. “When we were a tenant at Veterans Stadium, we didn’t have to do much beyond collect ticket revenues,” Mr. Gumienny says. “We didn’t even have to maintain the field.” Risk management rarely came into play because there was not much risk to manage. The Linc changed that. It has been a landmark football stadium in many ways. Considered one of the NFL’s greenest, the site has 14 wind turbines and 11,108 solar panels. On the Linc’s 10th anniversary, the stadium got a $125 million upgrade that included new high-definition video boards, two new connecting bridges for upper levels and enhanced Wi-Fi, allowing fans to check stats and highlights during the game. The upgrades were chosen based on research with season ticket holders, advisory boards and fan focus groups. That they do. According to an annual survey of NFL fans conducted by professor Mike Lewis at Emory University’s Goizueta Business School, the Eagles rank in the league’s top five fan bases year after year for money spent on tickets and gear, and passion displayed on social media platforms—win or lose. Mr. Lewis was surprised that the Eagles do so well in the survey considering they have not typically earned the national recognition of teams like the New England Patriots and Dallas Cowboys. “It’s a strong indicator that they have a very passionate fan base and suggests that management has done a good job of putting the fans first,” Mr. Lewis says. Back when the Philadelphia Eagles played at the city-owned Veterans Stadium, Frank Gumienny did not have any duties on game day. So in 1999 he became the spotter for the Eagles Radio Network. Using hand signals, he would point out who made each play on the field to commentators Merrill Reese and Mike Quick so they could relay the details without pause. He would serve in that role until 2014. As CFO Mr. Gumienny frequently serves as the chief events coordinator. He has booked events including soccer matches and concerts featuring U2, Taylor Swift and other pop music stars. It falls to him to set up contracts with performers and manage risks that accompany non-football events. Mr. Gumienny calculates the upside and risk, determining if he wants to pay more upfront and take a higher percentage of the profits, or pay less upfront and allow the performers a bigger possible return. Expanding the use of the Linc to bring in new kinds of revenue is only possible because of the organization’s “trust relationships,” he says. Mr. Gumienny can negotiate a concert for a Tuesday night because he has faith that Tony Leonard, the Eagles’ director of grounds, will get the field back in game shape by Sunday. “Checking out a sod field and booking concerts might seem outside the purview of a CFO, but it all ties back to the same concept: helping the team win,” he says. His efforts have not gone unnoticed. In his 2018 book Fearless: How an Underdog Becomes a Champion, Eagles head coach Doug Pederson calls out Mr. Gumienny for contributing to the team’s on-the-field success. “Afterwards, I’ll walk around and talk to people, who will all mention how bad Norm’s joke was that day,” he says. “It’s an easy way to connect.” It is also a way to rev up the employees—whom Mr. Gumienny simply calls “Eagles”—who interact directly with fans. Finally, he heads out to the parking lot, stopping by tailgate parties and visiting sponsors or fans himself. He likes to be around fans and let them try on his Super Bowl ring. Once a fan broke into tears after putting it on. 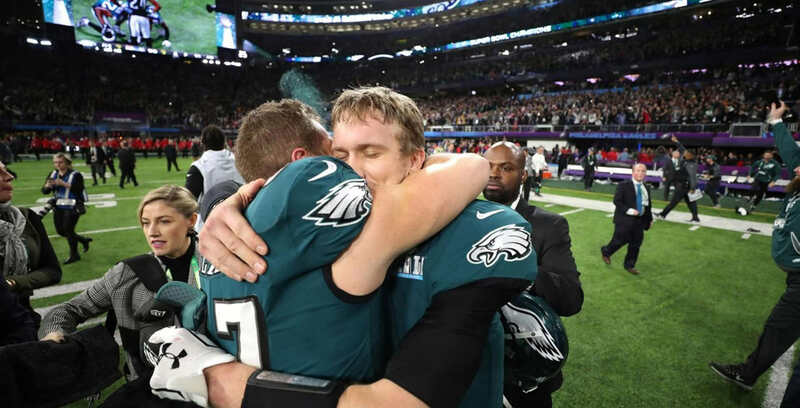 It took years for the Philadelphia Eagles to assemble the right people and build the right culture to carry the team to Super Bowl glory. In June 2018, a few months after the Philadelphia Eagles won their first Super Bowl championship, the team’s executive vice president of football operations spoke at Insigniam’s annual executive summit. 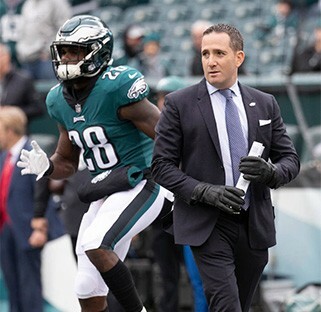 Howie Roseman has worked for the Eagles since 2000. In 2010, at age 34, became the National Football League’s youngest general manager (GM). After taking a “gap year” to rethink the organization’s culture and strategy, Mr. Roseman returned as GM. He and other Eagles leaders began rebuilding the team around a new head coach and quarterback. The rest is history. The following is an excerpt from Mr. Roseman’s speech at the summit. There was a lot of micromanaging the first time I was a GM. But the reality of it is, we hire good people, and we have to empower them; we have to let them hire their staffs and hold them responsible for it. We have to let them figure out the vision and principles they want to run that staff. The way we did this is we started to meet more regularly. We started to have open discussion about anything. Nothing was off limits—best idea wins. When we did this, we got everyone more involved and feeling more part of the team. And when they do that, and they see something that’s not going right … they feel a vested interest to make sure that they’ll get it right. When we won the Super Bowl, the pure joy of people in the organization was because they felt part of it, from day one. From day one when Coach Pederson walked in the building … from day one when we started [the 2017 season] … When we look back at it, not having a lot of resources … led us to be process-driven and not get off track. And now the challenge is staying that way—because you have some success, and you get careless. So for us, going forward we have the same challenges. We have a good team, we’re trying to keep it together, and we don’t have as many draft picks. So what can you do? … We’ve got to figure out the next way to innovate. We’ve got to figure out the next hidden edge that we can find. This article appeared in the Spring 2019 issue of Insigniam Quarterly, with the headline “All About Winning.” To begin receiving IQ, go here.